Drum top workstation by Spill Station is easy to install and use, fits 205 litre steel tight-head drums and works with all types of rotary drum pumps. 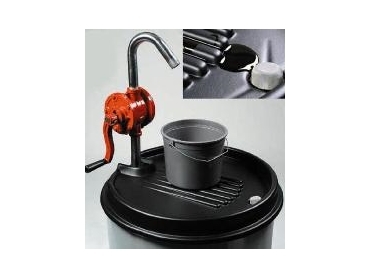 The Drum top workstation is made of durable, non-corrosive and chemically resistant polyethylene. Drum top workstation helps to reduce waste removal costs and dangerous slip and fall incidents, while saving time and money. Drum top workstation pays for itself, by saving up to 4 litres of liquid per drum. Drum top workstation saves material, returns it fresh to the dispensing drum and keeps the drum head clean helping to eliminate spreading of mess.